You know you are in the right place when your bartender is sporting a tattoo of a knife and a fork, along with one of a Bordeaux wine glass for good measure. These people are serious about food. I’m judging not just by the tattoos, but by the torrent of local buzz about the new husband and wife team of Nathan and Bonnie Snow, who are serving up authentic rustic Italian home-style meals at their new restaurant here in New Paltz. 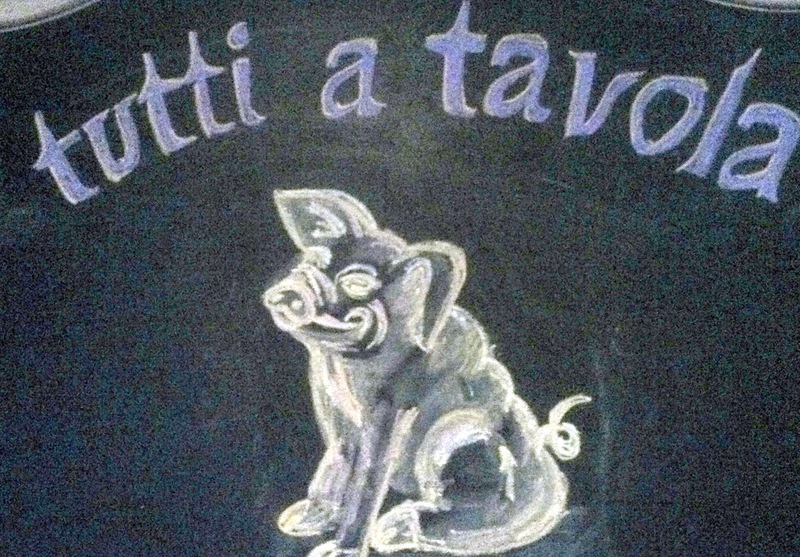 The restaurant’s name, and the sign that greets you in the bar, tells the story well – “Tutti a Tavola!” or “Everyone ~ At the table!”; mom’s call to dinner in every Italian household. Mangia! The owners both earned their culinary spurs in a number of New York’s finer kitchens, before opening up a place of their own. Nathan has primary kitchen duty, with Bonnie holding court out front, but I am told that she gets the credit for the restaurant’s home made breads and desserts. The space that houses New Paltz’s new favorite destination is very homey too. The bar still sits at the rear entrance, with little changed since it welcomed diners to Beso, and the Loft, and Loup Garou so many years ago. The dining room and the loft upstairs are as comfortable as your mom’s kitchen with well weathered “farm tables” scattered about and spaced with enough room to not crowd your neighbors. We had arrived early for our 6 PM reservation, and waited for our table-mates at the bar. Our new favorite bartender Derek (he of the foodie tattoos) was showing off his latest syrup concoctions, one a blend of pistachio and cardamom. He makes these up for sodas and cocktails, and some also end up flavoring Bonnie’s house made ice creams on the dessert menu. I asked him to make me a pistachio soda and I have to say the first thing I thought of when I tasted it was that it would have made a good ice cream. Go figure. We perused the wine list while we were waiting and sampled a glass of chardonnay – a Castel Venus from Trapani in western Sicily, available by the glass at $10 or $38 per bottle. The wine list was modest in scope and modest in pricing, with a dozen decent selections of Italian reds. A Guidobono Barbera D’Alba ($42) from Piedmont would have been my usual selection, but I saw a wine I had not tried that looked interesting. We tried the Santa Caterina Togiana Rosso Riserva, a meritage style blend of local grapes – Caniolo, once the primary grape of Tuscany, along with the grape that replaced it in popularity, Sangiovese, blended with an interloper – Cabernet Sauvignon. It was actually the most expensive wine on the list at $65 (marked up about 3/1), but we were glad we tried it. The menu at A Tavola represents the owners’ efforts to work with locally grown produce and meats and cheeses from local purveyors. The dozen listings offer house made pastas and charcuterie, with bread and pastries all baked on premise. The dishes are classic home-style offerings like gnocchi and pappardella, chicken under a brick, garlic and cannellini soup ($9), and last Sunday, an antipasti of crostini with whipped ricotta and honey, a beet salad and a farro salad. They all looked so good we ordered as many appetizers as we could without embarrassing ourselves, including one “for the table”. LOL. I started with the house specialty – grilled octopus. I cannot count how many people have told me about this dish. People have come up to me on the street to ask me if I have been to A Tavola and have I tried it – so it was with no small measure of high expectations that I ordered it. To me grilled octopus is the quintessential dish of classic rustic Italian (or Spanish) cuisine. I look forward to ordering it whenever it is on the menu at Aroma Osteria in Wappingers, or Mercado in Red Hook, two kitchens that do a spectacular job with it. Here the chef pairs a half dozen impossibly tender slices of braised imported Portuguese octopus with a melange of garbanzo bean and savory grilled red peppers sauteed with a few precious Ligurian Taggia olives. It was as good as advertised, and better. You really do need to try this. A plate of crispy pork belly confit ($12) was just as tasty, glazed with an apple cider reduction and plated with some arugula and course ground mustard. Another evening special was the aforementioned crostini, I think made with browned slices of some of Bonnie’s home made bread – a salt crusted country style white – which was spread with a honeyed whipped ricotta and sprinkled with flecks of rosemary. It reminded me of the classic desert of chestnut honeyed ricotta, but this was even better, paired with the beets and the farro – a rustic wheat salad. It was absolutely fantastic. I had a hard time not ordering the chicken “under a brick” ($23) from the regular menu for my entree, because I really wanted to compare it to Gigi Trattoria’s. I was dissuaded from ordering that because I couldn’t pass up one of the evening specials – a platter of monk fish balls – “polpette” – served over a puddle of savory lentils. I was glad I ordered it, and I also have an excuse to go back very soon – to order the chicken. The hit of the evening was the pappardelle bolognese, available as an entree for $25 or a half portion for $13. This bolognese was silky smooth (chicken liver? ), and obviously had been on the stove developing flavor since last Thursday. It was wonderful. The roast duckling breast, which also garnered rave reviews, was served a perfectly pink medium rare, with a confitted leg, some braised kale, and a sweet potato side. Another classic “Cucina Rustica” dish was the big bowl of braised tripe that my table-mate, Doc, ordered, served in a garlicky tomato base. Wonderful stuff. I cannot tell you the last time I was this blown away by a new restaurant. The menu is admittedly in the style of cooking that I prefer to just about anything else, but that is only the beginning of the story here. The kitchen produces show stopping – and conversation stopping – platters of what is really just ordinary “rustic comfort food”. It is just so extraordinary that you forget that is what you are eating. That “extra ingredient” is more ephemeral. It is that little extra something that turns “good” restaurants into “favorite” restaurants. It is some combination of great food, or really comfortable space, or a favorite dish, bartender, or waitress, or in this case I think something even more special – any or all of the above, combined with the excitement and energy and passion and pride of a young (and extraordinarily talented) couple with their first restaurant. And it doesn’t get any better than that. Let’s all enjoy it while we can. Tutti a tavola!